Some Roman soldiers come in to collect his taxes. Simeon first hides, then denies that he has any silver. Dude. You are literally standing in front of silver bells as large as you are. You can't give them the littlest one? Apparently Simeon would rather piss off the soldiers and lose all his bells. Not the brightest bulb, this one. Melchior and Aaron catch up at this point and all three (along with Aaron's animal friends) follow the trail of the soldiers out of town. Up until this point this special was boring, but not offensive. That is about to change. Because guess which legendary Broadway actor is making a quick buck as the voice of Brutus, the lead Roman soldier? Zero Mostel. And guess what he's going to do next? Sing a song (one of a very small number in this short special) about the decline of barter and the rise of greed with the creation of money. Eesh. I'm just going to leave this link here and move on. Aaron has the bright idea of going down to play for the soldiers and... doing something after that. Seriously, he doesn't actually have a plan. This backfires when Brutus decides to melt down the bells, and grabs Aaron's drum and sticks to use for kindling. Wasn't this a magic drum in the last special? That doesn't seem to come up here, Aaron is just normal sad from his stuff being stolen, not freaking out that someone destroyed a magical artifact. In the meantime, the critters sneak the bells out of camp. Given the size of the camp (small), the size of the wagon full of bells (large), and the size of the camel (camel-sized), I'm going to say that these soldiers are not as observant as your average absent-minded professor, because it works and the animals get away with the bells. They elude pursuit by having the humans bury the bells so it looks like a dune. It would be funny if they couldn't find it afterward, but no such luck. Simeon erects a giant scaffold out of, apparently, thin air, and plays the bells to announce that Jesus was born. Side Note: Hilariously, throughout this special, Jesus is only ever called "the Babe", as though he is either a baseball star or a relation of He-Who-Should-Not-Be-Named. The bell ringing introduces our carol for this installment: Do You Hear What I Hear. I wrote last year about this song. I am more than a little pissed to see the way it's used here. The first and third verses are cut, removing any sense or progression. The lyrics traditionally follow the news of Jesus's birth from the natural world, up to the heights of power. The bells replace the first verse, removing the night wind entirely. Removing the third verse as well (said the shepherd boy to the mighty king) also removes the intended breakdown of class separation. So what you've got left is a lamb telling a boy, and COMPLETELY UNRELATED a king telling everyone else what they should think. I'm offended on behalf of good storytelling. 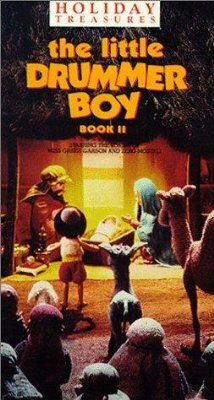 Anyway, we wrap up with Aaron deputized to lead the crowds to the manger, ostensibly to chase off the animals and stink up the place, but not to bring Mary and 'the Babe' to an actual hotel with sheets or anything. We had to order one of those 'Warner Archive' DVDs to see this one: the kind that aren't generally stocked anywhere because not enough people want to see it. I don't recommend you do the same.